Heavy-duty construction holds up to 800 lb. 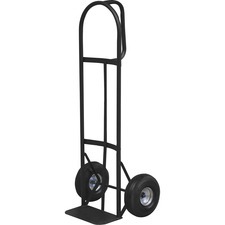 Heavy-duty hand truck features a D-Handle design that frees one hand to open doors while balancing a stacked load. Wide-tread, air-inflated, 10" pneumatic tires cushion the load over rough terrain. Hand truck holds 800 lb.